Audi TT RS coming to the U.S. - Is there a need for a BMW Z4 M? Audi TT RS coming to the U.S. – Is there a need for a BMW Z4 M? After a Facebook campaign that generated a lot of buzz in the automotive world, Audi fans have finally seen their dream come true. Audi of America put out the word that the TT RS, the high-performance sports roadster, will be in U.S. dealerships by the third quarter of 2011. With little competition in America, Audi seem to have found the sweet spot for the TT RS. The car will cater to true enthusiasts that are looking at the best-bang-for value, associated with driving thrills and high-performance. The car is faster, cheaper and better looking than the Porsche Cayman S, and sports an economical, yet fast 5-liter 2.5 liter turbo engine. TT RS puts out 360 horsepower and 332 lb-of torque. The engine was developed “exclusively” for the car, and won International Engine of the Year honors. Quattro system is included by default, another famous selling point for Audi. But what Audi TT RS really stands out with is the six-speed transmission. And this is where BMW fans come in. When the Munich-based company announced the launch of a new Z4 Roadster, everyone wondered when and if a Z4 M version will follow. BMW quickly came forward, unofficially, and crushed the dreams and hopes of their fans. With the economic crisis hitting hard every automaker, BMW felt there is no business case for a full-on M version of the Z4. To alienate the pain, BMW started working on sport version of the Z4. Dubbed Z4 sDrive35is (see our test drive), the enhanced and faster “is” came to the market earlier this year with a 3.0L twin-turbocharged direct-fuel-injected inline-6 and 335 horsepower at 5,900 rpm/332lb-ft of torque. But, contrary to what enthusiasts expect or crave, the Z4is is offered only with a 7-speed Dual Clutch transmission. With quattro all-wheel drive and a six-speed transmission, the Audi TT RS runs to 62 mph in 4.6 seconds, while the Z4 sDrive35is gets to the same speed in 4.7 seconds. A marginal difference if you ask us, but different execution and driving style. Sure, a Z4 M would never be a high seller for BMW, nor it will help them increase the profit margins, but without a supercar at the end of the scale, a super-sporty M-based roadster could have maintained the hope that BMW has not forgotten their DNA and their enthusiast drivers. Going back to 2006, BMW surprised everyone with the introduction of an M Roadster based on the E85 Z4. The car was powered by the same 3.2 liter, 8,000rpm, S54 inline-6 engine as the E46 M3, delivering 330 horsepower through a manual gearbox and a new 6-speed manual transmission. Since ///M stands for more than just power boost, the M Roadster borrowed performance parts from the M3, including the CSL’s compound (aluminum hubs, iron floating rotors) brakes and most of the M3’s suspension components. Other changes include a hydraulic steering setup which provides better feel than the electric system in standard Z4 models. In a single phrase, a true Z4 M, different and pure. 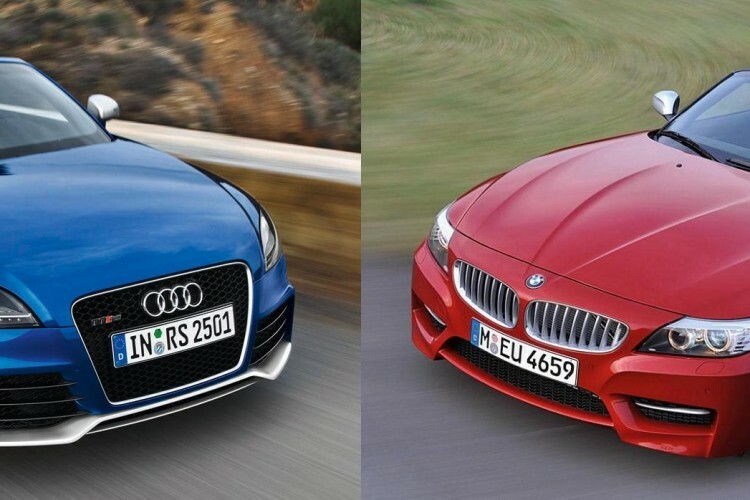 With Audi TT RS coming to the US, the top market for BMW M cars, is there a need for an Z4 M? Would have it made sense for BMW to plan for one? Would BMW enthusiasts think about jumping ship to TT RS? Lots of questions and of course, speculations since we don’t hold the key to the market data or research performed by BMW, but nonetheless, questions we are obligated to ask.